The buttoned mushrooms and the fresh herbs give this Barley Mushroom Soup extra flavor. 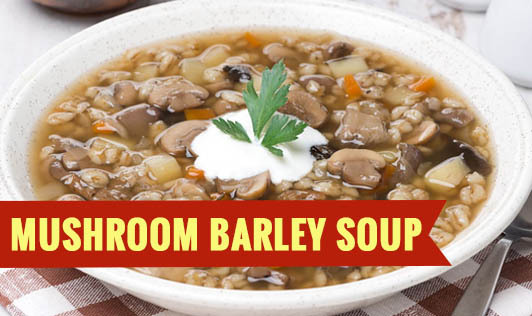 This soup is a great way to get all the health benefits of barley and mushroom. Maggie Chicken or Vegetable Masala Cube- 1 no. • Wash and soak the barley in 1 cup of warm water, while you prepare the rest of the ingredients. • Heat 2 tsp of oil and sauté the onion, garlic, and carrots in it for 5 minutes on medium heat, while stirring frequently. • Add the buttoned mushrooms and chicken cube masala, 2 cups of stock, and sauté for another 3 minutes. • Now add the drained barley and cook for about 2 minutes.